Halloween came and went without me having to deal with a single child. The candy, the costumes, the high-pitched noisy monsters – none of it interrupted my daily life of self-absorption and misanthropy. Still, I wanted to pay tribute to the horror genre on my blog. Problem is I hate the horror genre. Not too crazy about Halloween either, which is why we left our porch light off and refused to go to the door. Unlike others who see the holiday as their opportunity to be someone else – to play dress up or to shed their everyday skin for an excuse to make fools of themselves – I take the high road by mocking their shameful indulgence and remaining indoors where it’s safe. I’ve never been a big fan of holidays. The parties are just an excuse to indulge, make yourself sick and do things you’ll later regret. Plus, I never get invited. Besides, I’d rather watch horror movies. And I hate horror movies. I never saw any of the Friday the 13th films or the Halloween series or I Know What You Did Last Summer volumes one through nine. Nor am I a fan of horror novels. But I do enjoy thrillers, ghost stories, and the supernatural. So I guess for me the deciding factor is not the body count. It's the bodily fluids. Blood, vomit, pus, exposed bone just ain't my thang. I loved Bram Stoker’s Dracula (the novel, not the movie), H.G. Well’s The Invisible Man (again, the novel, not the movies), and Robert Louis Stevenson’s The Strange Case of Dr. Jekyll and Mr. Hyde (for the last time, not the movies). None of them is gruesome or grotesque. All of them are well written classics and entertaining. Yet my favorite of this genre would have to be Mary Shelly’s Frankenstein. Forget those God-awful films, both the black & white abominations and the more contemporary versions, one with Robert De Niro as Frankenstein’s monster, if you can believe that. No, purge your memory of those horrors of a different kind. Not one of them is true to the book. 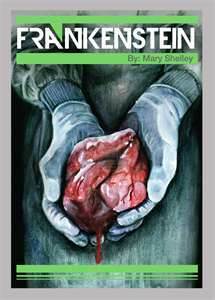 Frankenstein the novel is one of the greatest gothic tales not because of blood or guts or any other macabre images. Rather, it’s a study in psychological terror. The emotional horror our protagonist Victor Frankenstein suffers throughout is far more harrowing than any slasher film could ever hope to be, and that’s including the movie makers' spare-no-expense CGI and other special effects artistry. Who cares about the chick in act one who won’t put out and gets decapitated in the woods 5 minutes later (a sort of wish fulfillment by the screenwriter who got turned down in high school? I sometimes wonder.) When you can follow the hauntings of a man whose creation kills off all of his beloved friends and family as revenge for having been created, why would you settle for anything less? Spoiler Alert: That’s essentially the novel’s plot. A scientist decides to play God, brings life into the world through a series of unorthodox methods, if not morally reprehensible means, and yet horrified by what he has done, or rather by the repulsive appearance of the thing he creates, disavows any responsibility, and allows the monster to flee and fend for itself. The creature does just that, and as it wanders alone – surviving on nuts and berries in the woods, stealing a pie cooling on a windowsill of a nearby cottage, listening in on a small family and over time learning how to speak and even read, coping with its loneliness and its dejection from nearby villagers – it broods. In time it learns of its creator Victor Frankenstein, and it ponders its predicament. Whether inspired by its sense of isolation, its plight, its despair, the creature ultimately decides to wreak revenge upon its maker, perhaps to teach Victor what it means to be alone. The monster, rather than attacking Victor, slays Victor’s friends and family, gradually, so that Victor has just enough time to grieve over the death of his little brother or his best friend before the creature strikes again. Over time, Victor begins to lose his mind, tormented by his losses, haunted by guilt for creating the very thing that murdered his loved ones. Eventually, after bouts of depression and physical illness due in large measure to heartache, Victor resolves to kill the creature. He ends up chasing the monster around the world until finally finding and confiding in a ship’s captain in the Arctic Ocean. There Victor dies. The monster appears on the ship and explains to the captain that now he, the monster, can kill itself, since its creator is now dead. More than a simple horror story (at least of the psychological and emotional kind), this is also a cautionary tale. What responsibility does science have to society? Is there not a moral imperative at issue when playing God? I’m reminded of the pet owner who wanted to have her dog cloned. Did she not realize the pet’s memories are what distinguish that animal from its genetic copy? In the novel and the film Jurassic Park, the chaos theory scientist Malcolm warns the proprietor that simply because he could bring back dinosaurs doesn’t mean that he should’ve. Critics of the novel tend to lay the blame at the scientist Victor Frankenstein’s boots. And that’s certainly warranted. But some of these same critics excuse the monster’s behavior as the inevitable consequence of allowing the equivalent of an overgrown child full of angst to roam free. A fair point, to an extent, and yet I think free will argues against this. Reminds me of Dickens’ Oliver Twist, in which the recurring theme or message was that criminality was the inevitable result of society’s or government’s apathy toward the poor. The fact that not everyone born into poverty becomes a criminal seems to me a reasonable argument against that theory. While Frankenstein the novel may seem quaint to the modern reader, the equivalent of a 21st century youngster testing his patience with the film Gone with the Wind, the story is still an entertaining read and a classic. I just might read it again next year while nibbling on my two toned orange and yellow caramel corn candy. With my porch light off again, of course.